A Tasty Mess: Fish Twice A Week Keeps The Doctor Away? Fish Twice A Week Keeps The Doctor Away? Doctors and health experts are always telling us to eat more fish and, in our house, I try to serve fish twice a week (sometimes I succeed, sometimes I just cave to make way for a good pasta instead). An omega-3-rich fish like salmon graces our table once a week and I try to incorporate a white fish as well. I like to cook with tilapia, but you really could swap out the tilapia for any firm white fish you like. I've used cod, pollack, haddock and flounder in these dishes and they all work really well. When you're shopping for fresh fish, there are a few things to look for to ensure you're getting a quality fish. Check out this article on About.com for specific characteristics to look for as you buy fish. Make sure you always ask the fishmonger if you can smell and look closely at whatever you buy, whether it is a whole fish or fillets. 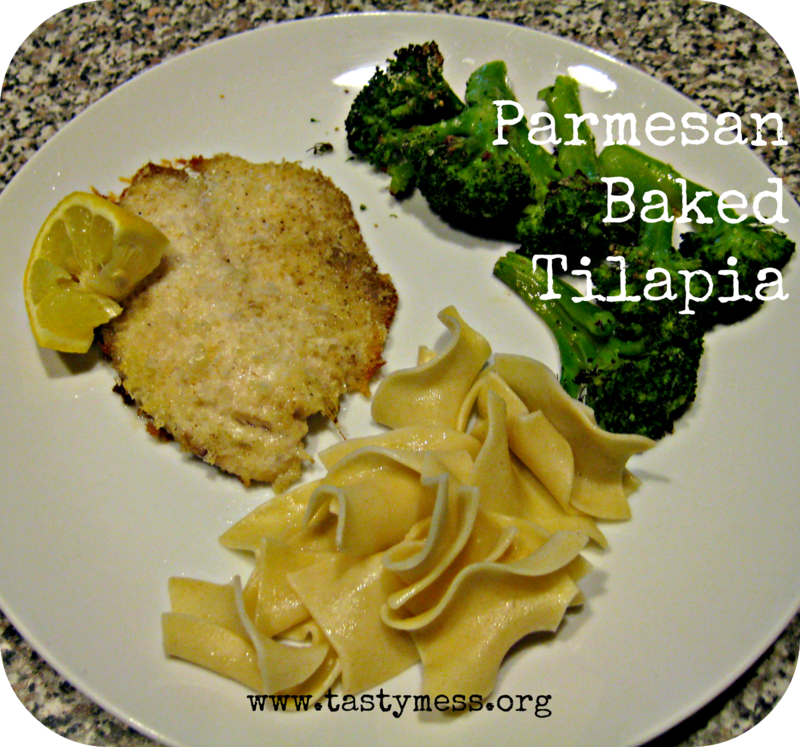 This recipe for Parmesan Baked Tilapia is incredibly simple and easy to throw together for dinner. I like to serve it up with a side of roasted broccoli and either couscous or egg noodles. Punch up the flavor by adding some paprika or garlic powder to the panko mixture. Preheat oven to 400 degrees and line a baking sheet with aluminum foil, spray lightly with the nonstick spray. Mix together the Parmesan, panko, paprika and a generous pinch of salt & pepper. Mist the tilapia with the cooking spray on both sides, then press into the panko mixture, gently pressing with your fingers to make sure it sticks on both sides. Transfer to the baking sheet and cook for 10-12 minutes. Serve hot with lemon slices.